DISCLOSURE: Note that this blog post contains affiliate links. Meaning, should you click on the links, I may receive a commission at no cost to you. We are a participant in the Amazon Services LLC Associates Program, an affiliate advertising program designed to provide a means for us to earn fees by linking to Amazon.com and affiliated sites. For more, please click here. The below list are all tools and resources that I am currentlyusing. I will keep this list updated as I find new things that are really working for me! For Growing Graci, I’ve used both BlueHost and SiteGround. Right now, we are using SiteGround. Overall, I’ve found that SiteGround has amazing and fast customer service and they’ve always been able to get back to me within a few hours for any problems I have. One thing to note when looking into hosting is not just how much the first year of hosting is but how much the years after will be. You don’t want to have to move your entire website over to another host after a year. It’s possible, but a headache! While I am happy with Siteground and I am on my second year of hosting with them, I encourage you to price shop! The banner below is an affiliate link. Something that is VITAL to set-up immediately on your website is Google Analytics. This will be how you track your page views and what content people are looking at. It will be super valuable to you as you grow your blog. I highly recommend using Mailchimp if you’re just starting out. It is somewhat limited in the super technical things that you might want to try later on, but it’s a great place to start and I don’t think that your email system is something that you should spend money on until you’re in the big leagues. In my opinion, you cannot be a blogger without Tailwind. It’s that essential. Besides your hosting package, Tailwind is the only other thing that I really think you should pay for when you are first getting started. Tailwind allows you to schedule Pinterest pins throughout the day so that you don’t have to be manually sending out the pins for your blog posts. It’s genius. Get A FREE MONTH of Tailwind! It can be really helpful to have some sort of paper planner to keep yourself and your to-do lists organized. I’ve been using Erin Condren products since 2015 and currently use the Daily Petite Planners to keep my blog to-dos organized. There are three main ways to make money from your blog: ad networks, affiliate marketing and selling your own products. I’ll go through a few tools and resources for ad networks and affiliate marketing below. This ad network is AMAZING and does not require major page view counts to earn money. And, what is better is that there is no payment threshold that you must hit before you actually get PAID to your PayPal account. AWESOME. Please note that the following link is a referral code that will earn me $10 if you start running FOMO ads. Thank you in advance! When people start their blogs, one of the first things they implement to make money is Google AdSense. While it is super easy to start earning money this way, it is a very slowmoney-making venture – like many daysyou’ll only earn $0.01 or nothing at all. And, in order to “cash out”, you’ll have to have hit a $100 threshold. That said, if you can generate some good traffic on your blog, it may be worth implementing! If you’re starting a blog, you probably want to make some money doing it! One of the ways that you can make money blogging is by doing affiliate marketing. Affiliate marketing allows you to share product links with your readers/followers and get paid by the company when they make a purchase or complete some other specified action. ShareASale is one of the first affiliate marketing platforms that I joined for Growing Graci. 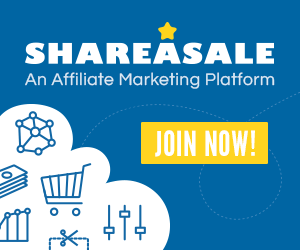 While many companies allow you to get an affiliate code through them directly, many companies use networks like ShareASale to streamline the process of becoming an affiliate. With ShareASale, you can quickly apply to be an affiliate for TONS of different companies. Check out more by clicking the banner below. Please note that the banner below is an affiliate link. One of the quickest ways to start making money with you blog is to sign-up for Amazon Associates. Almost everyone has bought something from Amazon that they love! By becoming an Amazon Associate, you can use links to refer your readers/followers to products on Amazon. In turn, you’ll receive a commission! SCORE. Keep in mind that you can start placing links on your blog pretty much right away with this program, but you will have to be formally approved for the program after you refer 3 orders within 6 months. Check Out the Amazon Associates Program! Do you have any essential blogging resources or tools that you think I should check out? Let me know below!